Binding of growth factors to their receptors is known to cause endocytosis and degradation of the receptors and their ligands by a mechanism that involves the endosomal sorting complex required for transport (ESCRT) machinery. Failure of this mechanism can lead to cancer development. 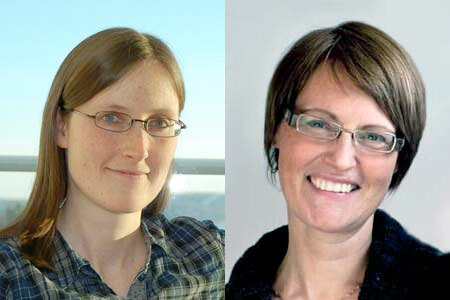 In a recent paper in Nature Communications, a team led by project leaders Eva Wenzel and Camilla Raiborg at Institute for Cancer Research and Centre for Cancer Cell Reprogramming has used advanced microscopy methods to reveal the dynamics of ESCRT recruitment and formation of multivesicular endosomes (MVEs) into which the receptor-ligand complexes are sorted for subsequent degradation. 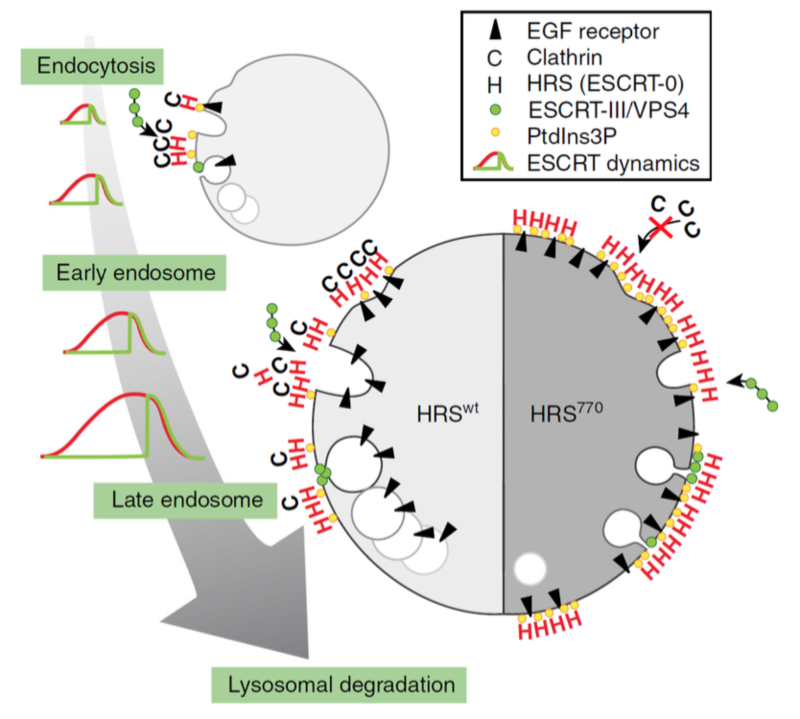 The ESCRT machinery consists of 4 subcomplexes called ESCRT-0, -I, -II and -III, which function in cooperation with an ATPase, VPS4, to mediate sorting of endocytosed growth factor receptors to the lumen of the lysosome, where the receptors and their bound ligands are degraded. This occurs via sorting of the receptors into intraluminal vesicles (ILVs) which form by invagination and pinching-off of the limiting membrane of the endosome, resulting in the formation of MVEs (see figure). Camilla Raiborg and her co-workers in Harald Stenmark's group had previously established that ESCRT-0 is recruited to endosomes upstream of the other ESCRTs, and that this recruitment depends on binding of ESCRT-0 to an endosomal lipid, phosphatidylinositol 3-phosphate (PI3P). Camilla had also found that ESCRT-0 recruits a large coat protein, clathrin, to form electron-dense clathrin coats on endosomes, which function as platforms for endosomal receptor sorting. What was not known was the dynamics of recruitment of the various ESCRT components, their relationship to ILV formation, and the importance of clathrin in this context. By adding fluorescently labelled growth factor to cell lines expressing fluorescently tagged ESCRT proteins and making observations by live-cell imaging and electron microscopy, Eva, Camilla and their co-workers were able to show that recruitment of ESCRT proteins falls into two classes: Either slow and gradual recruitment, as shown by ESCRT-0 and ESCRT-I, or fast and transient recruitment as shown by ESCRT-III and VPS4. Interestingly, recruitment of ESCRT-III and VPS4 coincided with the peak of ESCRT-0 recruitment, and these coordinated recruitments happened repetitively on single endosomes. Evidence was obtained that each of these "waves" of ESCRT recruitment corresponds to the formation of one ILV. Both, ESCRT recruitment, ILV formation and growth factor receptor downregulation were found to be strictly dependent on PI3P. Remarkably, proper ILV budding was also found to require the binding of clathrin to ESCRT-0, and abolishing this binding resulted in elevated levels of ESCRT-0 and PI3P on the endosome membrane. This study is the first to establish the relative kinetics of ESCRT recruitment to endosomal membranes and their relationship to ILV formation. The results also suggest a novel role for clathrin beyond concentrating the sorting machinery in endosomal microdomains, namely in recruitment of a factor that controls endosomal levels of PI3P. It will now be interesting to identify this factor, which is likely to be constituent of a feedback cycle which controls the timing of ESCRT recruitment and ILV formation. Given the importance of the ESCRT pathway for avoiding hyperactivity of growth factor signalling, it will also be interesting to study this feedback cycle in relation to tumour suppression. The present work would not have been possible without the involvement of the Helse Sør-Øst core facilities for Advanced Electron Microscopy and Advanced Light Microscopy, and, in particular, electron microscopist Sebastian Schultz contributed strongly to the work. Model of ESCRT-dependent ILV formation and the role of clathrin. Left: to ensure efficient cargo degradation in lysosomes, ESCRT proteins and clathrin are recruited to endosomes as they mature, in a coordinated and repetitive wave-like pattern. Each wave lasts for three minutes and correlates with the formation of one ILV. Right: in the absence of endosomal clathrin, the wave dynamics are disturbed, ESCRT-0 and cargo accumulate on the endosomal membrane, and ILV formation is perturbed. Consequently, the size of the forming bud is smaller, the forming ILV has a longer neck, and the diameter of the few ILVs that do form is smaller. Concerted ESCRT and clathrin recruitment waves define the timing and morphology of intraluminal vesicle formation. Wenzel EM, Schultz SW, Schink KO, Pedersen NM, Nähse V, Carlson A, Brech A, Stenmark H, Raiborg C.
Nat Commun. 2018 Jul 26;9(1):2932. doi: 10.1038/s41467-018-05345-8.